Barrier H. 5ltr. Non-toxic, natural herbicide for the eradication of ragwort. Can be used all year round. Can be applied at all stages of growth, can be sprayed onto flower heads only, to stop the seeding process straight away. Ideal for Councils, Highway Authorities etc. to prevent weed spread to neighbouring land. 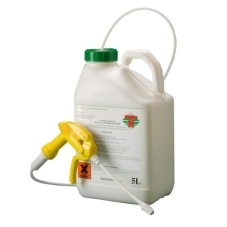 Sold as a ready to use spot spray in a 5ltr container with application gun. Within hours of application, small rosetts are dead, right through to the roots.